Flowers, feathers, granny chic plastic rain hoods and fringing: Christopher Kane showed an eclectic and exciting collection for autumn/winter 2016. 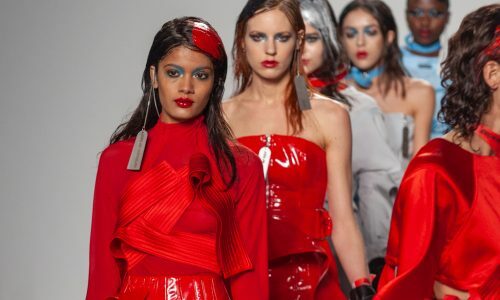 Held at the Tate Modern, the popular designer showcased his latest looks in front of celebrities Daisy Lowe and Laura Carmichael. The ideas of restriction and expiry were key, with scaffolding lining the centre of the catwalk. This translated into cage-like garment structures in beige and black, intertwined with translucent lace, and pinstripe ribbons with translucent spaces between them on flowing silk and organza dresses. 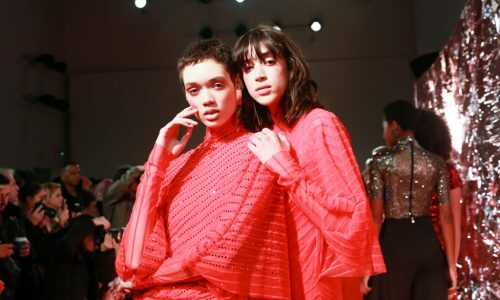 Showing his latest Lost and Found collection for London Fashion Week, Christopher Kane showed wonderfully painterly silk florals in oranges, purples and blues and drapes, revealing lots of leg in strapped and halter dresses, hanging down over one leg and asymmetrically draped over the fronts. Fur gilets and coats covered barely there translucent sheer lightly printed chiffon dresses, and gorgeous oversized grey coats, softly lined with white fur collar, hems of dresses peeking out underneath and large fur scarf stools. Deconstruction was shown on the shoulder – unzipping sleeves at shoulders on fur coat. 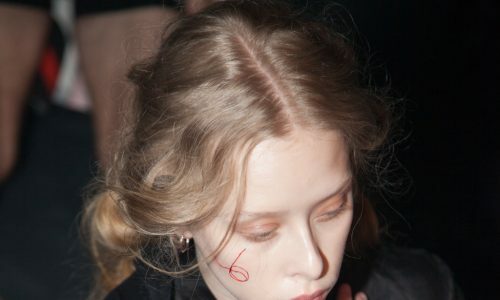 Christopher Kane described an expiration of beauty for this season, and it is this idea of the cessation, which allows for the new, revitalization and renewal. 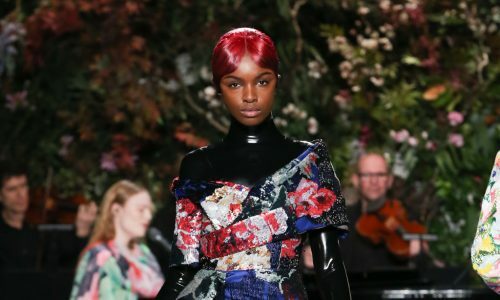 This was reflected in the modernist painterly aesthetic of florals – therefore key to the look, as well as through elements of deconstruction and reconstruction. Painterly silk florals in oranges, purples and blues swathed over models, slit to revealing skin. Full-length sheer florals covered in green and pretty pinks, flowers with sheer chiffon with large poppy-like brooches and embellishments. Blood red coats and chic dresses included cut-out triangular sections and were decoratively embellished with elements of fringing. Primary colours of red, yellow and blue emblazoned eveningwear with bold floral prints on draped chiffon and silks, and red and black pinstriped polo sweaters elegantly slit at the base. Maypole ribbons flowed down, provided fun and wearability to the looks, some of which were accessorised with clear and grocery store blue granny plastic rain bonnets. 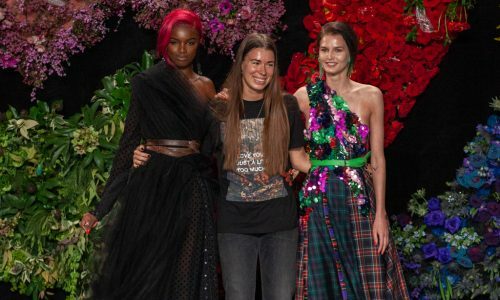 A seasoned-professional, Kane showed an incredible collection of pieces – all of which are highly covetable and thoroughly modern. 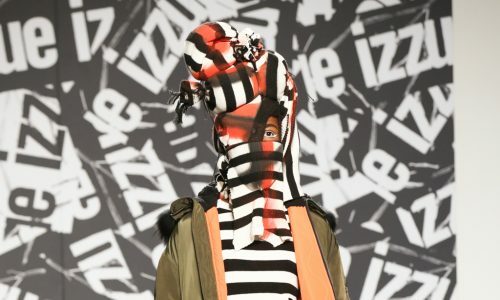 This is sure to delight both his adorning celebrity fans and fashionistas alike, and the collection only adds to further cement his status as an unmissable part of London Fashion Week.